In its quest to become a dominant world economic power, China has run into yet another obstacle it cannot solve. Atheist Communism fosters vice and rampant corruption, yet a long-term successful economy depends upon a climate of trust found in Christian virtue. So how can China reconcile the fundamentally incompatible two ideals? It seems it would like to have the benefits of Christian virtue sans Christianity. There is definitely a correlation between Christian values and economic prosperity. Christian values help make people honest which is a necessary element for building trust and this is essential to any economic transaction. Unfortunately, relationships inside China suffer immensely from a lack of trust and honesty. This same defect also plagues its relationships with international trading partners. Dr. William Jeynes, professor of education at California State University states that the lack of trust is part of a larger problem; that is the general lack of mores in China today. “The Chinese believe that if the level of immorality that exists today, sexual immorality especially, persists, then the economic strength of the country cannot continue. So they very quickly want to teach morality, especially to the young before their economy might indeed collapse.”2 How is China going to teach a morality to their youth that is diametrically opposed to atheistic Communism? 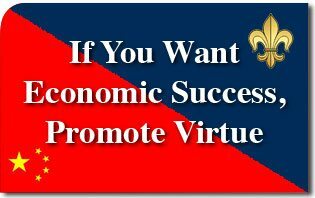 While someone might object that America is far from practicing exemplary virtue, the American economy is based on a notion of basic virtues such as honesty, hard work and dedication, which has resulted in a booming agriculture, industry and commerce. If China really wants a stable and productive society, it should abandon the errors of its Communist Party’s empty rhetoric and adhere to a tried and proven method of promoting virtue. It is no wonder that there are many rumors that Communist China is headed for an economic crash. With an “ethic” based on corruption, bribery and vice, there is no foundation that can impart the idea of trust that is so sorely needed. China will find real economic success only if it promotes virtue, otherwise it will follow the dismal path of other failed Communist projects.